So, the third of my three death metal reviews this week, and in my opinion, the best has been saved for last. 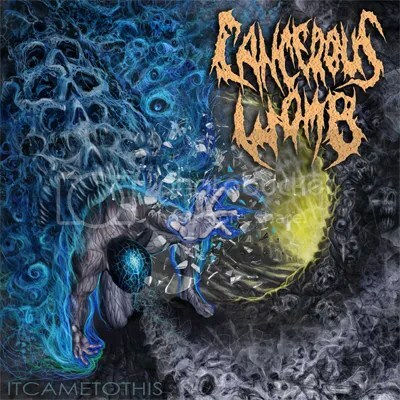 Cancerous Womb have recently been through a bit of a shake-up, parting ways with original vocalist Chris Lewis, but this doesn’t seem to have slowed them down. They have been very active both at home in the UK and across the rest of the world, and returned to the land of recorded works with an absolute beast of a new sound. As was subtly hinted at on their debut long-player, Born Of A Cancerous Womb, this is a band with a will to deconstruct, then reassemble, the tropes of modern DM. The difference here is that they have fully flung open the floodgates of restraint and just gone for it. Welcoming in the memorable hooks of thrash, alongside some mind-boggling grind, they have ditched any concept of genre defined song structure, and it has resulted in a collection of attention grabbing numbers, which crash through the headphones all too quickly. There is a sense of the tongue-in-cheek to some of the passages, which makes them stick in the mind even more, but that may not be as apparent to non-musicians. Regardless, they are highly enjoyable purely as musical moments. Some are simple and powerful. Some are furious and intricate. Every second is gold. If you are intrigued by the concept of Suffocation/Nile DM riffs meeting the jangle of Mastodon, the chaos of Pig Destroyer, and a scattering of evil thrash – handed out with complete disregard for expectations, and a little indefinable something else – this is an EP you really need to cram into your lugholes. Short and sweet. And sour. Bring on the album!